A welcome to Pemberton sign along State Highway 83. PEM-BER-TON. The word rolls off my tongue in three syllables, a cadence of sound that names a southern Minnesota town. 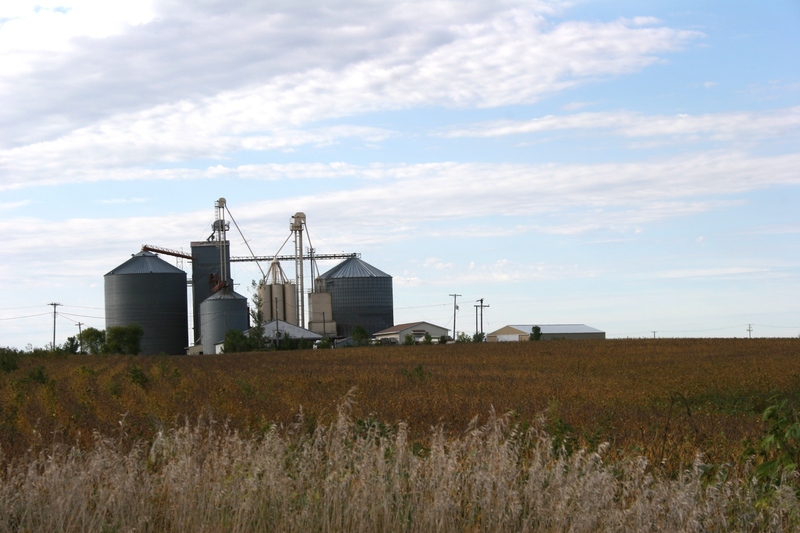 I’d never been to this community southeast of Mankato on Minnesota Highway 83, only heard of it tacked onto the end of Janesville-Waldorf-Pemberton Public Schools. But Saturday evening I was in Pemberton for a wedding reception and dance. I arrived early, wanting to explore this town of about 250 before heading over to the former school turned community center. My quick tour revealed the usual run-down, boarded-up old buildings balanced by a well-groomed park and newer homes. Mostly, though, I was intrigued by the signs on downtown buildings. Pemberton's main street was quiet on Saturday except for wedding guests driving through downtown. 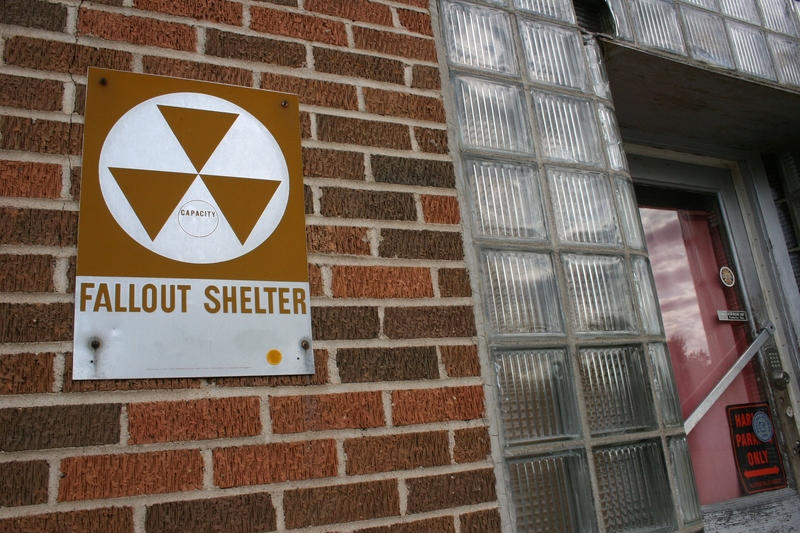 When was the last time you saw a FALLOUT SHELTER sign? I found one tacked onto the front of a boarded brick building whose original purpose I wouldn’t even want to guess. The faint writing at the bottom of the sign warned: NOT TO BE REPRODUCED OR USED WITHOUT DEFENSE DEPARTMENT PERMISSION. For those of you who grew up during the 1960s, during the Cold War, like me, a FALLOUT SHELTER sign brings back memories of teachers instructing students to duck under desks and protect their heads, as if that was going to do any good in the event of a nuclear attack. My husband recalls the particular concern about Communist attacks given his central Minnesota school’s “close” proximity to North Dakota missile silos. Thankfully those Cold War days of hysteria are behind us and many, many years have passed since I’ve seen a FALLOUT SHELTER sign. A Fallout Shelter sign on a downtown brick building. Another sign, on the door, warns: Harley Parking Only: All Others Will be Crushed. The brick building upon which the Fallout Shelter sign is posted. 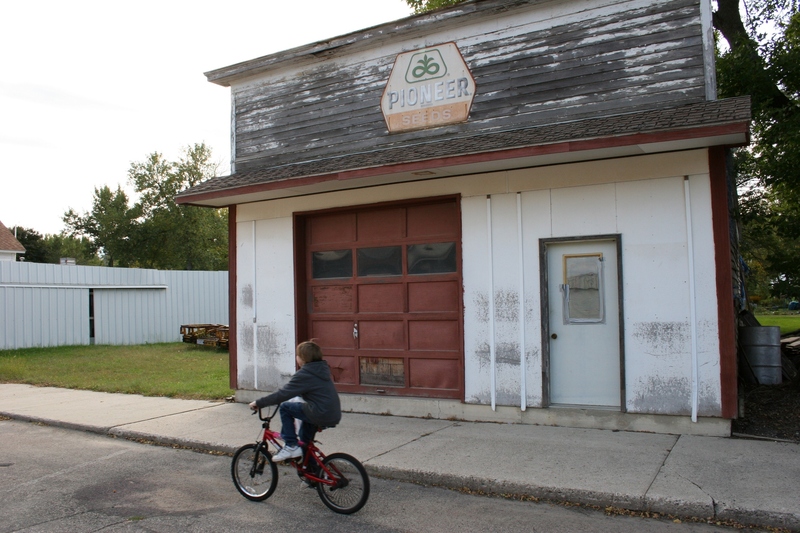 Across the street, I spotted a weathered PIONEER SEEDS sign on an old garage and, as a boy pedaled past on his bicycle, considered how carefree small-town life can sometimes be. I never allowed my children, when they were elementary-aged, to ride their bikes solo in Faribault. But that’s the difference between small towns and mid-sized cities like mine. 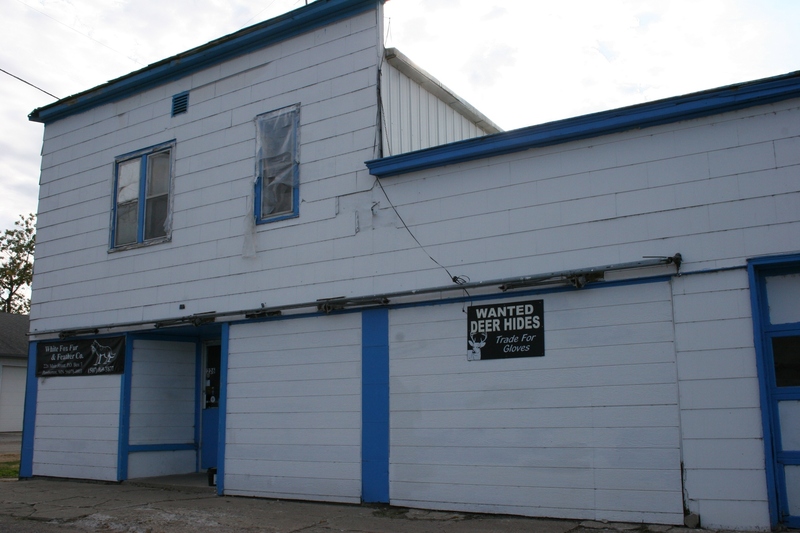 An old Pioneer Seeds sign drew my eye to this building. And you won’t see a sign like this in most towns: WANTED DEER HIDES—Trade For Gloves. Another sign identified a corner white wood frame building with gaudy blue paint trim as White Fox Fur & Feather Company, supplier of natural materials for the fly fishing industry, according to the company Web site. Turn your deer hides in here, at White Fox Fur & Feather Company, in exchange for gloves. I wondered if any of the other wedding reception attendees noticed the downtown signs that tell the story of Pemberton, past and present. 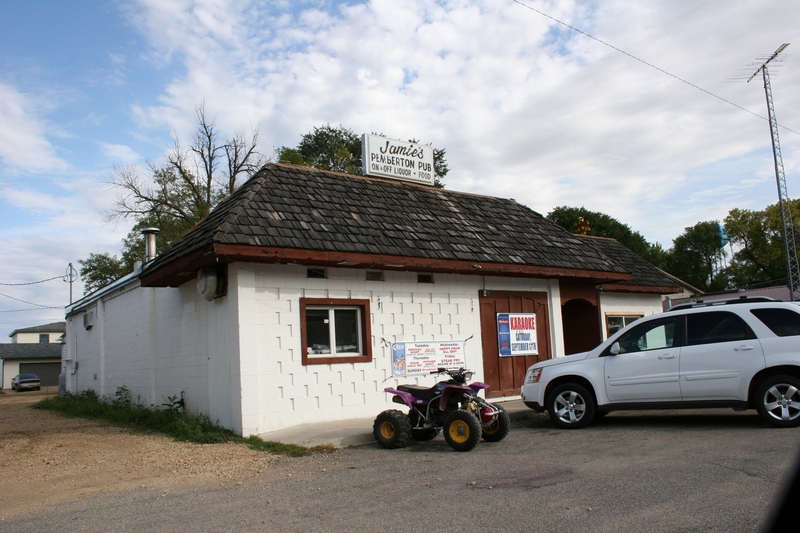 At Jamie’s Pemberton Pub, a pit stop for the wedding party, signs informed me of Mexican Night, Texas Hold ‘Em, Pitcher Night, All day Happy Hour, a Steak Fry and the small-town bar standby, karaoke. Obviously, this is “the place” in Pemberton. Jamie's Pemberton Pub seems to be the happening place in Pemberton. 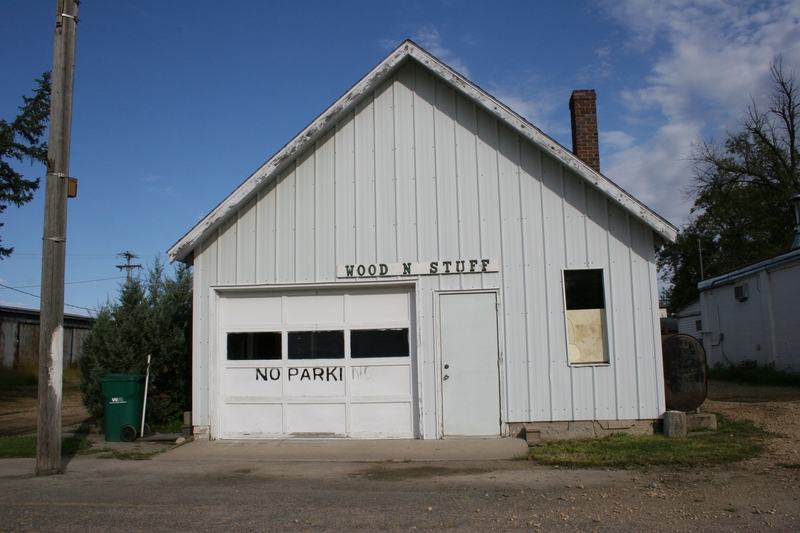 I wondered about WOOD N STUFF, about the wood stuff built inside the non-descript building with the overhead garage door. The building could use a bit of polishing, maybe some decorative wood work, to draw customers. Or maybe the place is closed. What types of products are made at Wood N Stuff? Closed. 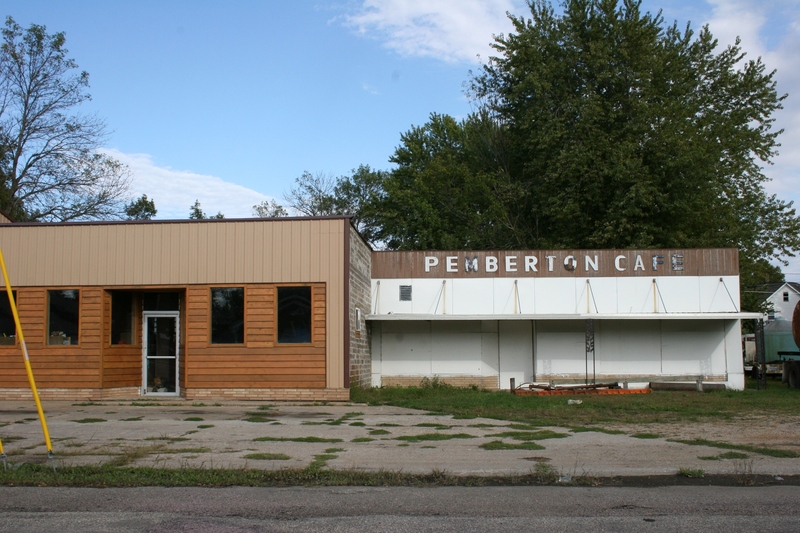 The Pemberton Café, likely once the local hot spot for coffee and cards, sits forlorn, windows shuttered, grass sneaking through the cracks in the sidewalk, in a scene all too common in rural Minnesota. 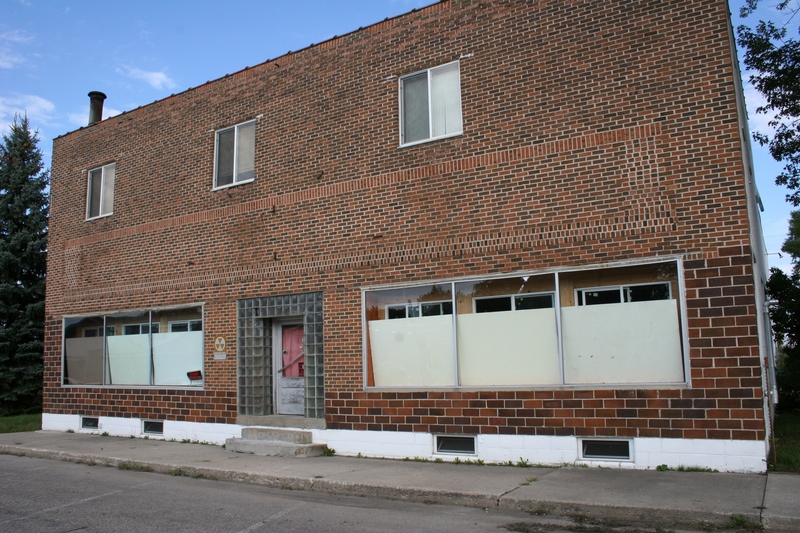 The abandoned Pemberton Cafe on the town's main street. 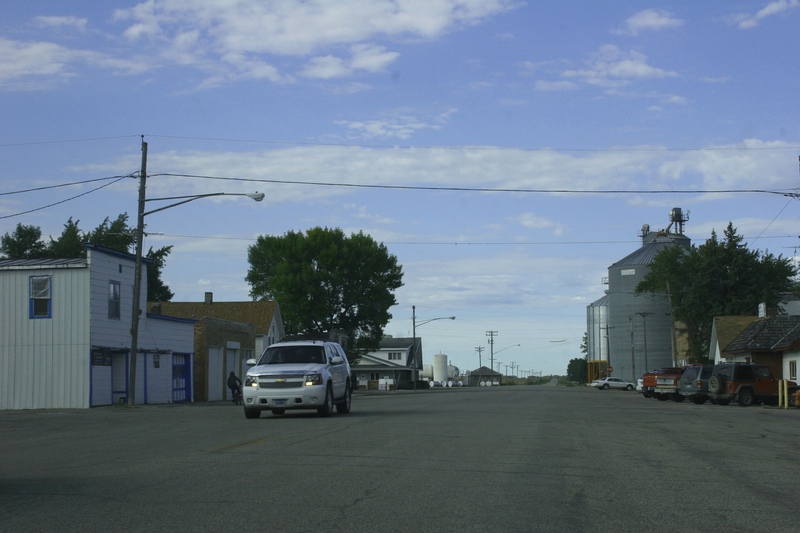 Yet, despite the abandoned buildings, the closed school, Pemberton survives, anchored like all farming communities by the grain elevator. This is home, a town with a busy convenience store, a post office, a beautiful community center, a park for the kids and a FALLOUT SHELTER. 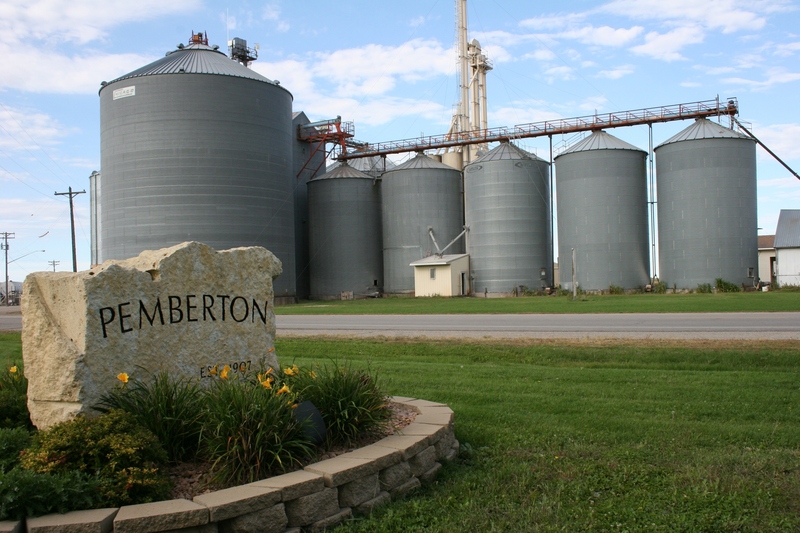 Approaching Pemberton from the east, the grain elevator and bins mark the skyline.